Emphasizing a pale green that is meant to mimic Spanish moss, this Japanese serving plate is the perfect size for serving tapas, appetizers, cheese and cracker plates, and sushi. Shaped like an ellipse, this plate’s lifted edges ensure that none of the food you are serving will slide or spill. Carefully handmade in Japan, this dishwasher and microwave safe plate is sturdy and versatile. 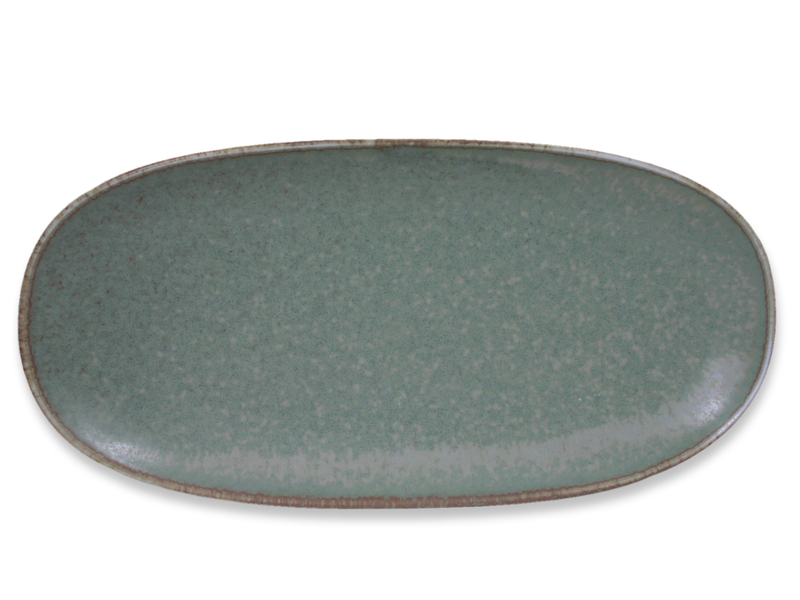 This ceramic plate’s pale green sprinkled with specks of blue will accentuate any colors of the food you are serving. Topped off with a beige rim, this Japanese serving plate’s natural look will make it seem like you brought a small piece of the forest into your home. With its papery, smooth texture, this mid-sized Japanese serving plate is a mixture of elegant and down-to-earth, much like the other products in the Moss Green series. Aside from just being used as a serving plate, this plate can also be used as a center piece to hold small sauce bottles and salt and pepper shakers.